Giffard Park Moorings is a place on the waterways minor waterways place place on the waterways major waterways place village town city on the Grand Union Canal (Grand Junction Canal - Main Line - Gayton to Brentford) between Great Linford Railway Bridge No 76A (disused) (6¼ furlongs to the west) and Bridge No 78B (Grand Junction Canal) (3¼ furlongs to the south). 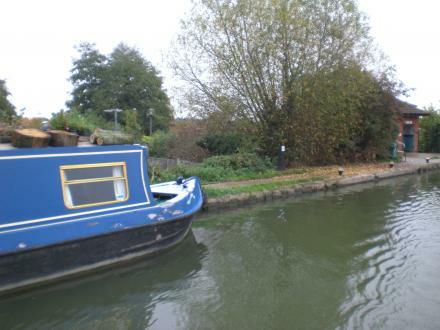 The nearest place in the direction of Great Linford Railway Bridge No 76A (disused) is Linford Wharf Winding Hole; 2¼ furlongs away. The nearest place in the direction of Bridge No 78B (Grand Junction Canal) is Giffard Park Sanitary Station; ½ furlongs away. M1 Motorway Southbound, Junction 1415 Newport Pagnell, Welcome Break, Newport Pagnell, MK16 8DS — 1159 yards to the north. M1 Junction 1415, Newport Pagnell, MK16 8DS — 1182 yards to the north. Btw Jct 14 & 15, M1, Newport Pagnell, MK16 8DS — 1219 yards to the north. 11 Vermont Place, Tongwell, Milton Keynes, MK15 8JA — 1447 yards to the east. Unit 3 Delaware Drive, Milton Keynes, MK15 8HD — 1400 yards to the southeast. Neath Hill, Milton Keynes, MK14 6HG — 1636 yards to the south. Santa Cruz de Tenerife — 1202 yards to the north. 597 yards to the south. Milton Keynes — 1447 yards to the north. 5 Tower Crescent, Milton Keynes, MK14 6JY — 1578 yards to the south. Lower Stonehayes,Great Linford, Milton Keynes — 1098 yards to the south. Broadway Ave, Milton Keynes, MK14 5QN — 147 yards to the east. Newport Pagnell — 1217 yards to the north. 7 Knebworth Gate, Giffard Park, Milton Keynes, MK145QD — 232 yards to the east. Milton Keynes, MK14 5PT — 947 yards to the southeast. Newport Pagnell Motorway Services, Newport Pagnell, MK16 8DS — 1158 yards to the north. Great Linford — 1340 yards to the southwest. Wolverton Road, Great Linford, MK14 5AH — 1157 yards to the west. Newport Pagnell, MK16 8DE — 1166 yards to the northeast. Pipard, Milton Keynes, MK14 5DF — 1241 yards to the southwest. Bernay Gardens, Bolbeck Park, Milton Keynes, MK15 8QD — 1580 yards to the southeast. Yeomans Drive, Milton Keynes, MK14 5AN — 925 yards to the southeast. Delaware Drive, Milton Keynes, MK15 8JH — 1486 yards to the southeast. Great Linford MK14 5DZ, Milton Keynes, MK14 5DZ — 538 yards to the west. giffard park, Milton Keynes, 0000 — 143 yards to the northeast. Kennington Close, Newport Pagnell, MK16 0NJ — 1436 yards to the northeast. M1 Northbound, Milton Keynes, MK16 8DS — 1147 yards to the north. Milton Keynes — 1149 yards to the southwest. Jct 14-15 - M1 Northbound, Milton Keynes, MK16 8DS — 1189 yards to the north. 33 Broadway Avenue, Milton Keynes, MK14 5QB — 283 yards to the northwest. Silverstone — 1471 yards to the northwest. Great Linford, Milton Keynes, MK14 5EF — 559 yards to the west. 677 yards to the east. 653 yards to the north.